During the spring of 1995, I was a typical freshman engineering student with my head buried in the books. The university was still finding its “spirit legs,” and it was common for students to wear apparel from other colleges on campus. New traditions were in the making at UCF, and there were rumors of a new Golden Knight appearing around campus. 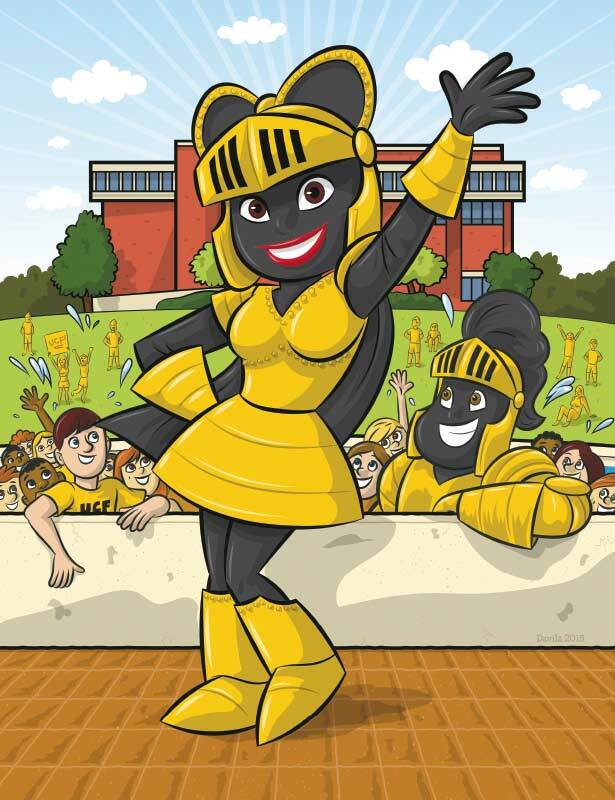 UCF mascot Glycerin made her debut at Homecoming in 1996. Intrigued, I approached cheerleading head coach Linda Gooch, ’85, at a basketball game and asked if they were looking for someone to be the mascot. Linda said, “Are you kidding? We have been looking everywhere.” She connected me with Trey Gordon, ’96, the cheerleader who had become the new costumed character. And with Gooch’s encouragement, plus training from Gordon, I embarked on a journey that few freshmen have experienced — becoming one of the students behind the Knightro mask. With the help of the Student Government Association Spirit Office, the mascot team began doing what we did best — improvising. Some hunted down the perfect pieces to transform the old costume, while the rest of us planned the unveiling. And with a curly blonde wig, a size 5XL sports bra from Wal-Mart and a giant golden bow, the character began to take shape. We were still gluing on her red construction paper lips 15 minutes before her big reveal at the Homecoming pep rally. The plan went perfectly. The Marching Knights and cheerleaders led a parade to the front of the Reflecting Pond, where the master of ceremonies announced the Lady Knight “tryouts.” First he called up a student to tell a joke, because Knightro had a great sense of humor. Knightro was not impressed. Next, the mascot needed a girl who was fit, so she could keep up during his numerous event appearances. Another student was called onstage and did 10 impressive pushups, but didn’t make the cut. Finally, the announcer suggested that Knightro needed a girlfriend who was classy. After all, he was an important and famous Knight. Suddenly, the song “Bad to the Bone” began to play, and the crowd parted. The Lady Knight made her way to the stage aboard a golf cart “chariot.” Knightro was smitten, and Glycerin was born. The following year, UCF Athletics gave the spirit program $5,000 to hire a company to design a professional Glycerin costume. 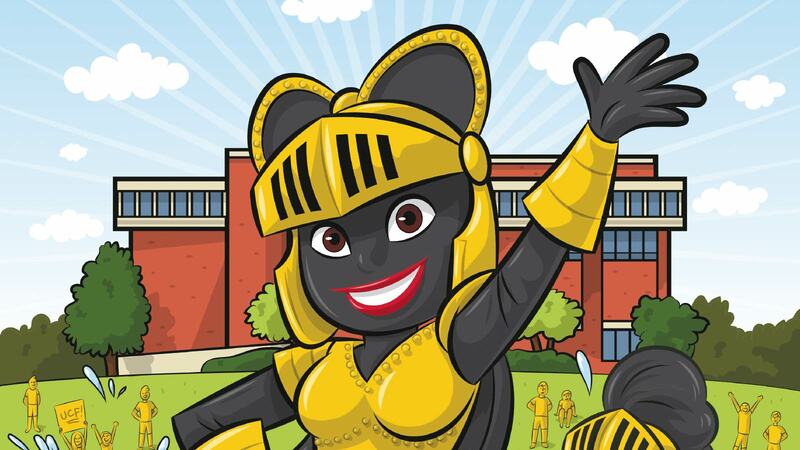 She made appearances for the next three years, until the university decided to focus on Knightro as the singular UCF icon. Today one of my recruits for the mascot team, Mike Callahan, ’05, coaches the program. And every time I return to campus for a game and shake Knightro’s hand, I’m filled with pride because I realize that though I started out in the Citrus Bowl with thousands of empty seats, Knightro has gone on to perform for sold-out crowds at Bright House Networks Stadium and during nationally televised bowl victories. Through this one faceless character, we have all been part of an incredible journey.